After scientists have gone to such lengths to produce individual layers of atom-thick graphene it might seem odd that stacking them up again is one of the most exciting areas in the field right now. However, some of the most remarkable recent results in graphene research have come from joining two single layers of graphene together at a precisely controlled ‘magic’ angle. Exactly what’s going on is still something researchers are grappling with, but the ability to turn graphene, an exceptional conductor, into an insulator and then all the way to a superconductor has got materials scientists fired up. Among graphene’s many extraordinary properties, perhaps its strangest is its ability to conduct electrons as though they were massless particles – with a constant velocity regardless of their energy. 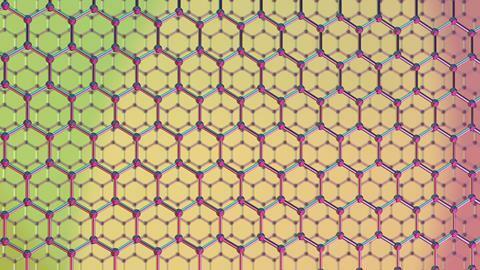 In monolayer graphene, this is about 106m/s – many times higher than in most semiconductors. This not only explains graphene’s extraordinary electrical mobility: it also ensures the electrons’ energy is mainly kinetic, with the interaction energy between electrons a minor correction. This is not necessarily true, however, at lower speeds. Several experimental groups attempted to realise MacDonald’s prediction. One of these was led by Pablo Jarillo-Herrero of the Massachusetts Institute of Technology (MIT). ‘Theorists in our community predict many things,’ he says. ‘Sometimes they turn out to be correct, sometimes they don’t.’ The group tested the idea by systematically cleaving flakes of graphene from graphite before picking up one flake using a polymer, rotating it by 1.1° – which became known as the ‘magic angle’ – and stacking it on top of another. 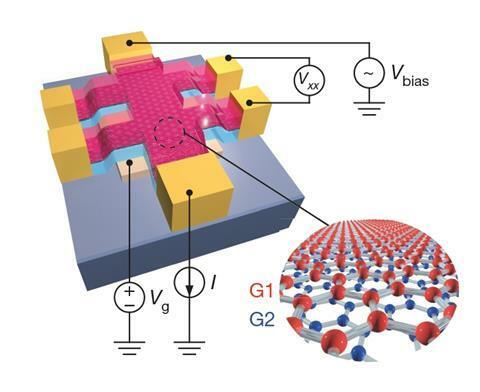 In 2018, the group unveiled their results in two papers.3,4 In one, they observed a correlated insulator state at temperatures below 4K when the bands normally responsible for conduction in graphene were exactly half-filled with electrons. When the two lattices are slightly rotated with respect to each other, it creates a periodic structure called a moiré superlattice as the hexagons move in and out of phase and to a corresponding periodic modulation of the band structure. The researchers attributed the insulating state to localisation of electrons at favourable sites within the moiré pattern. By keeping the temperature below 1.7K and either feeding electrons into or out of the structure, the researchers found they could produce an electron- or hole-doped superconductor, respectively. ‘We were expecting maybe an insulating state due to correlations. 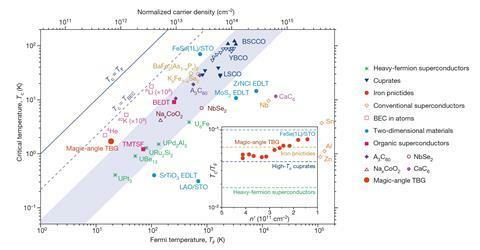 We knew that superconductivity could happen but we didn’t really consider it, so that was a surprise,’ says Jarillo-Herrero. MacDonald was also delighted by the MIT experiments. ‘It was the most wonderful thing that could possibly have been found, and certainly not something we would have dared to predict,’ he says.